Indian Mango Lassi is a delicious smoothie that we enjoyed at the end of our Indian meal. India produces a staggering 1.2 million tons of mangoes annually so it is no wonder that it is their national fruit. This recipe is easy to make, I made ours with a hint of cardamom and it was excellent. 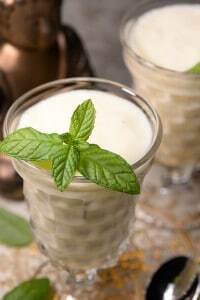 The thick and smooth lassi was perfect to soothe the palate from the heat of the delicious Indian curries we enjoyed. 2 cups of fresh chopped mango pieces, about 3 to 4 medium sized ripe mangoes. In a blender or mixer, puree the mangoes with sugar or honey and cardamom powder or saffron or rose water. Blend for some seconds till the everything is mixed well and the yogurt has become smooth. If you want a slightly thinner consistency, you can add some milk to the mango lassi while blending.